I just received this announcement about the first resident art exhibit at Artspace from Michele Pamer and the graphic from Katie Sehr. The opening is next Friday, May 2nd at 6:30 and the show runs through Saturday June 14th. 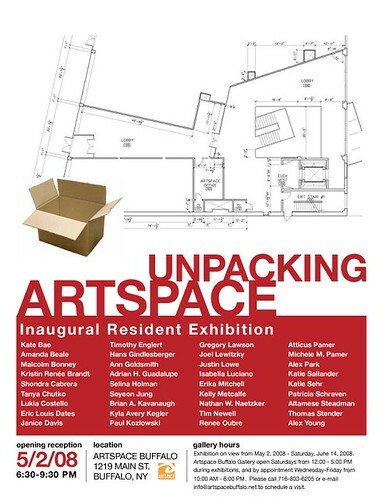 Artspace Buffalo Gallery is pleased to announce the inaugural resident-artist exhibition Unpacking Artspace. An opening reception will be held on Friday, May 2nd from 6:30-9:30 pm at the newly completed Artspace Buffalo Gallery, 1219 Main Street, Buffalo, New York. This is the very first art exhibition held at Artspace Buffalo since the building project was completed in early 2008. This exhibition is open to all residents of Artspace Buffalo, presenting a glimpse into each artist's practice. The work of over 35 artists from all ages, experiences and disciplines will be shown. Many Artspace artists are seasoned veterans of the art world, having shown work in galleries and art fairs from Buffalo to Tokyo over the past several decades. Other Artspace artists are just beginning to experiment with art making, having never shown their work in public. Diversity in every area is the one common thread of Artspace. The mediums included in Unpacking Artspace -- painting, installation, drawing, photography, sculpture, collage, digital video, dance, music -- vary as much as the themes and concepts of each work. The show will also feature work of resident artists working on the design of fine furniture, graphics and jewelry. Drawing inspiration from natural form and gesture for his exotic wood-designed furniture, Thomas Stender's Tension proves that emotions can be conveyed even through a object as ordinary as a table. Shondra Cabrera suggests a common ground exists between haute cuisine and fine art with her untitled "edible art" sculpture, surrounded by slices of cake. Katie Sehr records small rhythmic movements on paper, documenting a meditative, performative process and resulting in animated yet minimal landscapes. Isabella Luciano, a student at the Buffalo Academy of Visual & Performing Arts by day, will perform Fire Poi (fire dance) during the opening reception, creating visual patterns with ignited Kevlar wicks spun on chains. In the spirit of documentary and collaboration, photographer Michele Pamer's Isabella Fire Dances documents the fire dance through her cinematic display of nine 12 by 12-inch Giclee prints. Story Telling, a narrative in pen and ink by Atticus Pamer, represents the work of yet another young Artspace artist. Complete list of artists included: Kate Bae, Amanda Beale, Malcolm Bonney, Kristin Renée Brandt, Shondra Cabrera, Tanya Chutko, Lukia Costello, Timothy Englert, Eric Louis Dates, Janice Davis, Hans Gindlesberger, Adrian H. Guadalpe, Selina Holman, Soyeon Jung, Brian Kavanaugh, Kyla Avery Kegler, Paul Kozlowski, Gregory Lawson, Joel Lewitzky, Justin Lowe, Isabella Luciano, Nathan W. Naetzker, Tim Newell, Kelly Metcalfe, Erika Mitchell, Renee Oubre, Atticus Pamer, Michele Pamer, Alex Park, Katie Sallander, Patricia Schraven, Katie Sehr, Altamese Steadman, Thomas Stender, Sandy White and Alex Young. Exhibition on view from May 2, 2008 through Saturday, June 14, 2008. Artspace Buffalo Gallery is open Saturdays from 12:00 - 5:00 PM during exhibitions, staffed by volunteer resident artists. The Gallery is also open by appointment only Wednesdays - Fridays from 10:00 AM - 6:00 PM. Please call 716-803-6205 or e-mail info@artspacebuffalo.net to schedule and appointment for individuals, schools or groups. For additional background on Artspace and what this development means to the surrounding neighborhood, please check out some of these links. 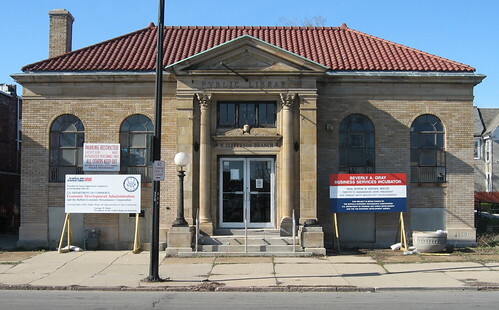 While walking past the old North Jefferson Branch Library the other day I noticed these new signs for the first time. 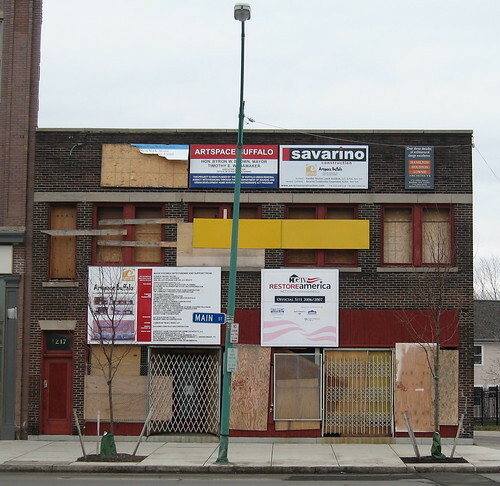 This morning I called Councilman Demone Smith's office for details about this development. I haven't heard back yet, so if anyone knows more about this new business incubator, please let me know. fixBuffalo readers will remember that the new Merriweather Library opened two years ago and replaced this building. The new library is named in memory of Frank E. Merriweather Jr. the former publisher of the Buffalo Criterion and founding member of the Buffalo Urban League. I've been following the long slow process of "demolition by negelect" of a number of properties in my Cold Springs neighborhood for the longest time. Time has run out for this single family home at 70 Riley Street, right around the corner from Artspace. I heard from a few area residents last night that the side of the house had recently collapsed. I walked over to check it out this morning. The house is still privately owned and the City officials who've seen this picture this afternoon have promised to move 70 Riley to the top of the demolition list. 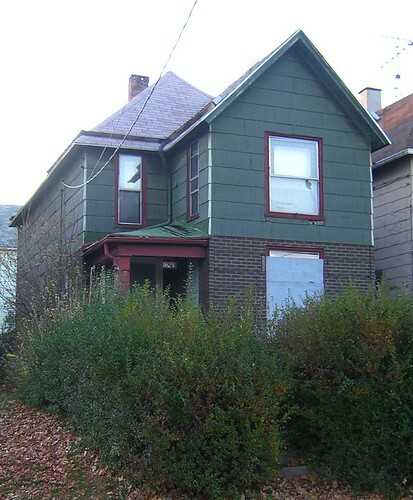 Here's what 70 Riley looked like a few years ago, August 2006. fixBuffalo readers may remember another single family home on the same block, 93 Riley Street from a post a few years back - Along Riley Street. If you didn't have the chance to see Harvard University's Edward Glaeser while he was in Buffalo last week Marc Odien and the crew over at WNYmedia.net were there and have generously made the following video available. 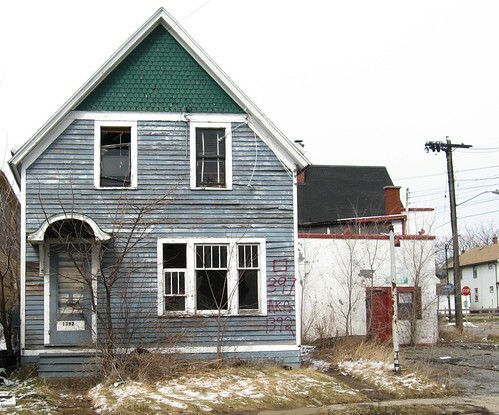 One of the first public responses to Edward Glaeser's presentation last week came from Paul Wolf, lead counsel at the Buffalo Municipal Housing Authority. 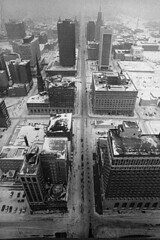 He writes about Glaeser's time in Buffalo - How do you Measure the Success of a City? - from his Buffalo Ideas blog. For additional background about Glaeser's take on Buffalo check out my earlier post. 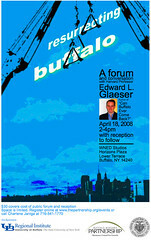 update - 4/23/08 - from Richard Florida - Ed Glaeser on Buffalo. update 3/5/10 - Paul's post is also available here - via Buffalo Pundit. 1042 Ellicott Street - Saved! The other day I stopped by 1042 Ellicott Street. It's located right around the corner from Coe Place and was owned by the City for the past few years. 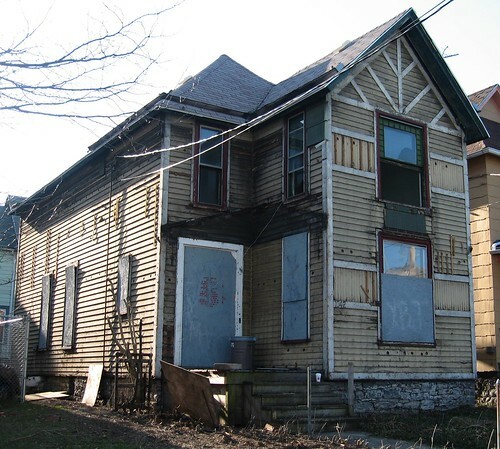 I'd always thought that the location and condition of this single family house would contribute to its revival and thought it was poised to bounce back from years of neglect. I had an opportunity to talk with the new owner about his plans for the place, too. 1042 is also right around the corner from Artspace where all sorts of additional rehab and development is taking place. 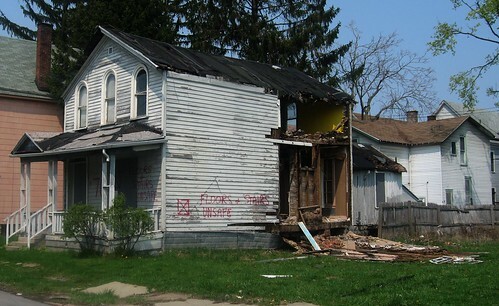 fixBuffalo readers may remember what 1042 looked like in November 2005. It seems like the asphalt shingle siding did an incredible job preserving the house's original clapboard and detail. In February 2007 I posted - 1042 Elicott - Just looking for love - with a set of interior shots. I'll be checking in and keeping tabs on progress here at 1042 Ellicott in the next few months. Harvard University economist Edward Glaeser will be in Buffalo on Friday April 18th and will address a forum at the WNED Studios. See - Resurecting Buffalo for additional details. Urban decline is not the mirror image of growth, and durable housing is the primary reason the nature of decline is so different. This paper presents a model of urban decline with durable housing and verifies these implications of the model: (1) city growth rates are skewed so that cities grow more quickly than they decline; (2) urban decline is highly persistent; (3) positive shocks increase population more than they increase housing prices; (4) negative shocks decrease housing prices more than they decrease population; (5) if housing prices are below construction costs, then the city declines; and (6) the combination of cheap housing and weak labor demand attracts individuals with low levels of human capital to declining cities. I located a podcast with Glaeser from EconTalk - The Economics of Paternalism [podcast after link] hosted by George Mason University's Russ Roberts. Interesting and slighly predictable take and discussion on 'behavorial economics' and rational choice theory from a libertarian perspective. Charlene Janiga at UB's Regional Institute told me earlier this afternoon that the $30 tickets are still available for Friday's event. They're available online, by calling Charlene at 716-541-1770 or at the door. I've been a huge fan of Artspace from the beginning and have been a supporter of the project since it hit the local radar in December 2004. Despite a few problems during the initial phases of site remediation - see, Secure the Site, June 2006 - and a few bumps in the construction schedule, the project has been really well received and a very welcome addition to the neighborhood. I've recently spoken to a number of the project's resident artists about the recent Artvoice article, too. Many of the issues - see, Space for Improvement - have been worked through, from what I understand. This building located at 1217 Main, right next door to the lofts, was purchased two years ago by Artspace . Development decisions still aren't set and always thought something like this should go here. Prime space for something cool. I revisited the 300 block of Koons Avenue the other day. fixBuffalo readers may remember this post - Shock and Awe on Koons Avenue - from last March. Well, the devestation is worse. A year later, three more houses have been added to the mix of miasma and malfeasance. Last year 15 of the 31 houses were in various states of abandonment and vacancy, today the new number is 18. 60% of a block is headed at some point to the landfill, so what? Well this block as you may recall is right next door to the newly renovated Harvey Austin School. Here's the map. This is the view from the front the school's front lawn, looking towards Koons. And a close up of what students see looking out the front window. Double checking ownership information for this block of Koons - 300/357 - I noticed something an interesting development since last year. I've compared both sets of property ownership information - here - for March 2007 and March 2008. Where as the City of Buffalo owned five properties last year, the number has more than doubled to 11 since I posted Shock and Awe. 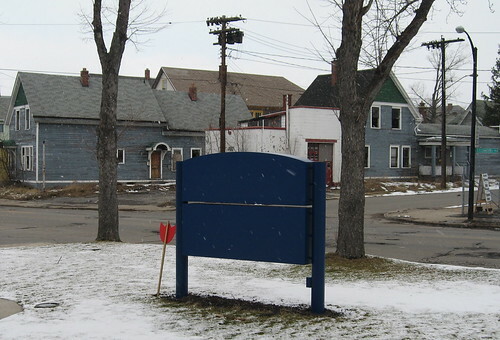 While residents of North Tonawanda are rightly shocked and upset about the recent tragic assult on a young school child - abducted and assulted in a vacant house near the school - residents of Buffalo are silent about this block of Koons Avenue, right next to the newly renovated Harvey Austin School.